In setting up Google Analytics (GA) implementations, we find that we need to integrate the work we do with the clients’ existing workflows and project management approaches. Typically, [from the client’s perspective] our implementations more of a “Waterfall” approach; we take on the implementation directly. We then set up comprehensive web tracking to the client’s specifications. We show the client how best to report on the data. However, there are other situations that come up. Perhaps the client’s development team needs to be more closely involved. Sometimes stakeholders need to know the project is clearly moving forward or multiple teams need to be involved. In these cases, a more open approach to Google Analytics is called for; breaking down the implementation into smaller components and pushing focus from a “turn-key” solution to iterative releases of a minimal viable product. 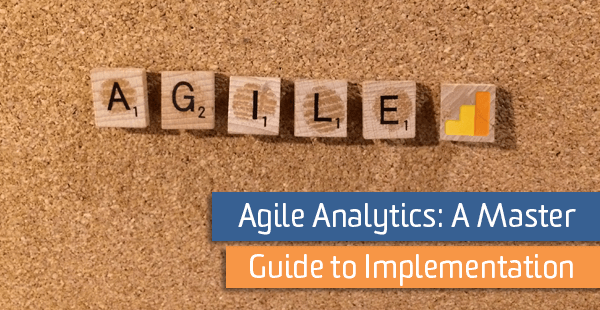 The following is an Agile-like framework outlining a typical Google Analytics implementation. When we say agile, we mean that the process outlined below provides incremental steps toward comprehensive tracking within Google Analytics. Each component of this outline will build on the other – achieving the minimum viable product. Not everyone has the time or resources to dedicate to a massive overhaul, so this process allows you to have a strategy and continually make improvements. You may not need everything listed, but Google Analytics implementations work well when they build off each other. Implement one component, validate that it was done correctly, then move on to the next one. The Components – the singular objectives that build upon one another that together furnish a complete GA tracking solution. The Process – the actual method that will bring each component to fruition. Discussion – Meeting to discuss a component’s status across the various aspects of the project, accounting for any dependencies – whether working synchronously or asynchronously with other components. Instruction – Provide guidance and action item assignments based component discussion. This can appear in the form of specific documentation or code requirements. Execution – Action items determined will be performed alongside support from any necessary parties. Confirmation – Once the prescribed actions are taken, each action will be reviewed for quality of execution. Verification – Overall, verify the output of the component, ensuring the outcome is as expected and meets specifications. Each process phase may be repeated in each cycle as deemed necessary. For example, more discussion and instruction may be necessary following a round of verification. Observing the web property and deciding the interaction(s) that best align with the company’s business objectives and how to best measure them. Each eCommerce data collection component is dependent on the other. A master component ensures each part will work in concert with the other. While all of this involves some form of implementation, there are some basics to learning how to make changes to your site. Your site may be different from others, so the process of setting up tracking should inevitably help setting up future tracking. Hacks and shortcuts in this phase may cause trouble down the line. Take the time to do things correctly, knowing that these are building blocks on which other steps rely. Ensure Google Tag Manager (GTM) is properly configured to implement tracking across the sites. Set up pageview tracking as a baseline in Google Analytics. Implement best practice and site-wide event tracking. Create custom dimensions and apply additional code where necessary. There are changes and setup necessary inside of the Google Analytics interface that will help keep your tracked data clean and organized, easily accessible, and clear to all stakeholders. Configure baseline analytics properties according to best practices. Learn and understand why we use filters, how to set them up, and implement necessary ones. Developing an implementation to measure search usage. Make segments informed by best practices as well as client direction. One of the most important features, use Goals to track conversions on your site. eCommerce comes in many flavors, at this time, we recommend everyone begin using Enhanced eCommerce. You don’t need to do everything at once, you can tackle the important stuff first, and then iterate through the extra features. Establish accurate transaction data collection in GA. Establish the checkout steps portion of Enhanced Ecommerce. Track product clicks and views inside Google Analytics. Record add to cart actions within Google Analytics. Track internal promotions within the site. Outside of these baseline components, there may be bigger picture items that can be addressed once the overall Master Components are fulfilled. The same processes could apply to these on the whole, but even these components could be further broken down into more nuclear parts. Create reports that satisfy any identified stakeholders. Leverage eCommerce tracking to create insightful reports. Work on integrating with a CRM database with GA and possibly BigQuery. Take advantage of potential advertising integrations and other GA 360 features available. Looking at the big picture is key. It’s important to constantly reassess how the implementation components align with the Master ones. When working across multiple teams and organizations, this is essential to any success. Have clearly established protocols for exchanging ideas and bringing up issues. Overall, this agile approach keeps stakeholders in the loop, allows relatively fast results and is one of many ways we can work toward the larger goal.